Effortlessly elegant and timelessly stylish, our Daniella Medical ID Bracelet is monochromatic in style, yet she’s anything but neutral. 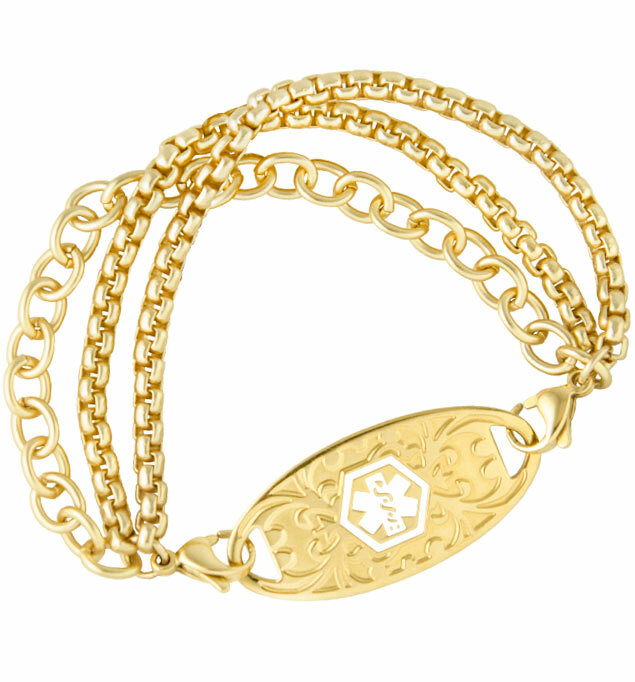 This head-turning stack of varied matte gold chains offers an on-trend, layered look with the security you expect of a Lauren’s Hope medical ID bracelet. Substantial in look, yet surprisingly lightweight, Daniella is a hypoallergenic med ID that’s as perfect with jeans as it is with your favorite little black dress. Your Daniella Medical ID Bracelet pairs with any custom-engraved Lauren’s Hope medical ID tag, keeping what’s truly most important to you right at hand. This stylish med ID is a great choice whether you or your loved ones wear medical alert bracelets for a history of weight loss surgery, celiac disease, epilepsy, Long QT Syndrome, or any other chronic medical condition or treatment consideration. Custom engraving allows you to choose the look you want so you can stay safe in style.